The following article was written by Bill Gross of Long Beach, CA who is the grandson of Bill Terry. Bill (William Abraham) Terry and his wife and Mamie lived in Minonk from about 1905 until his death in 1953. Mamie later re-married and moved to Fairbury, Ill. Bill was born in Spring Bay, Il in 1885; Mamie in rural Tennessee in 1889. 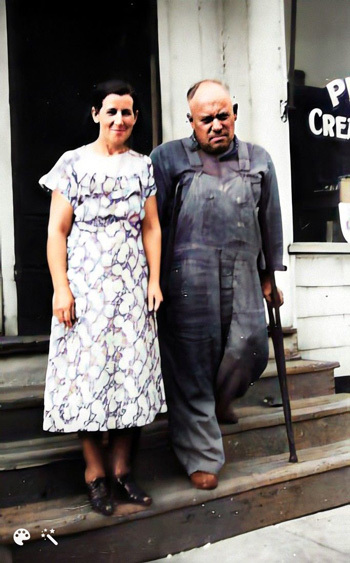 They owned and operated the W. A. Terry Shoe Repair Shop and Creamery Station in a small building next to the old Post Office during most of those years. (He may have operated a gasoline filling station before that.) Bill was crippled and used wooden crutches. He had had Infantile Paralysis (polio) when a baby and never walked; his left leg did not develop. They had two daughters, Mary and Mabel (my mother) both graduated from the local high school. Mary's nickname was Tom and Mabel's was Billie. 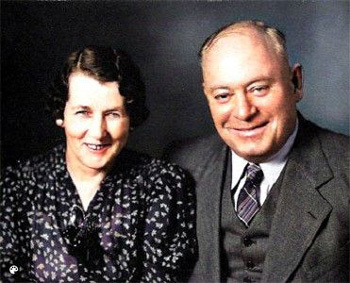 Mary had a short marriage to Ray Ketchmark, then married John Hines; they lived in Bloomington/Normal during the '30's and '40's. My mother married John J. Gross of Lacon. They moved to Chicago where my brother, Jack, was born in 1927 and I in 1929. Jack and I traveled to Minonk on the Pekin Express (Doodle Bug) to visit/stay with our grandparents during summer vacation each year during the 1930's. Bill repaired shoes for many of the townsfolk and local farmers. He was Irish (part?) and loved to tell stories. One I heard many times: The farmer said: "I like my biscuits with ham gravy." Response: "Who the hell don't?" Bill and Mamie are buried in the Minonk Cemetery, with hard to find headstones.